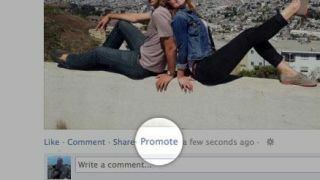 Egomaniacs will love Facebook's latest money-spinner, which gives users the option to pay to promote their own personal posts in friends' news feeds. Testers in the US now have the option to pay $7 (about AU$7 and £4) to promote their posts, with 5,000 accounts being given the option of pushing their updates to the top of friends' newsfeeds. The tests began in New Zealand in May, with 19 other countries (including Australia) also getting the narcissistic option ahead of the US. Facebook thinks you might want to use the paid option to make sure your big posts stand out as news feeds get more crowded. The social network suggests that you might want to ensure all your friends are aware of your wedding photos, your engagements or your garage sales. But we think that making sure everyone knows what you had for lunch or that your baby just gurgled, or sees that photo of your rabbit with mittens on its ears would be $7 well spent. After all, if you're going to use the digital equivalent of LOOK AT ME LOOK AT ME I'M PULLING A FUNNY FACE WHY AREN'T YOU LOOKING?, you might as well go the whole hog. Sadly, there's no word on which countries are next in line for the update and Facebook tells us there's no information on if or when UK users will be able to toot their own horns even more than usual. Twitter, meanwhile, has gone for the Facebook-esque option of offering paid-for Twitter surveys to brand accounts, which will appear as promoted tweets in the coming weeks.